Iris scan biometrics employs the unique characteristics and features of the human iris in order to verify the identity of an individual. The iris is the area of the eye where the pigmented or coloured circle, usually brown or blue, rings the dark pupil of the eye. The iris-scan process begins with a photograph. A specialized camera, typically very close to the subject, no more than three feet, uses an infrared imager to illuminate the eye and capture a very high-resolution photograph. This process takes only one to two seconds and provides the details of the iris that are mapped, recorded and stored for future matching/verification. Eyeglasses and contact lenses present no problems to the quality of the image and the iris-scan systems test for a live eye by checking for the normal continuous fluctuation in pupil size. The inner edge of the iris is located by an iris-scan algorithm which maps the iris' distinct patterns and characteristics. An algorithm is a series of directives that tell a biometric system how to interpret a specific problem. Algorithms have a number of steps and are used by the biometric system to determine if a biometric sample and record is a match. Iris' are composed before birth and, except in the event of an injury to the eyeball, remain unchanged throughout an individual's lifetime. Iris patterns are extremely complex, carry an astonishing amount of information and have over 200 unique spots. The fact that an individual's right and left eyes are different and that patterns are easy to capture, establishes iris-scan technology as one of the biometrics that is very resistant to false matching and fraud. The false acceptance rate for iris recognition systems is 1 in 1.2 million, statistically better than the average fingerprint recognition system. The real benefit is in the false-rejection rate, a measure of authenticated users who are rejected. Fingerprint scanners have a 3 percent false-rejection rate, whereas iris scanning systems boast ratees at the 0 percent level. Iris-scan technology has been piloted in ATM environments in England, the US, Japan and Germany since as early as 1997. In these pilots the customer's iris data became the verification tool for access to the bank account, thereby eliminating the need for the customer to enter a PIN number or password. When the customer presented their eyeball to the ATM machine and the identity verification was positive, access was allowed to the bank account. These applications were very successful and eliminated the concern over forgotten or stolen passwords and received tremendously high customer approval ratings. Airports have begun to use iris-scanning for such diverse functions as employee identification/verification for movement through secure areas and allowing registered frequent airline passengers a system that enables fast and easy identity verification in order to expedite their path through passport control. Other applications include monitoring prison transfers and releases, as well as projects designed to authenticate on-line purchasing, on-line banking, on-line voting and on-line stock trading to name just a few. Iris-scan offers a high level of user security, privacy and general peace of mind for the consumer. A highly accurate technology such as iris-scan has vast appeal because the inherent argument for any biometric is, of course, increased security. - The iris is a thin membrane on the interior of the eyeball. Iris patterns are extremely complex. - Patterns are individual (even in fraternal or identical twins). - Patterns are formed by six months after birth, stable after a year. They remain the same for life. - Imitation is almost impossible. Dr. John Daugman's work in iris recognition form the basis of this information. Information and images found on his website, http://www.cl.cam.ac.uk/users/jgd1000, are presented below. Iris recognition leverages the unique features of the human iris to perform identification and, in certain cases, verification. Iris recognition is based on visible (via regular and/or infrared light) qualities of the iris. A primary visible characteristic is the trabecular meshwork (permanently formed by the 8th month of gestation), a tissue which gives the appearance of dividing the iris in a radial fashion. Other visible characteristics include rings, furrows, freckles, and the corona, to cite only the more familiar. The first step is location of the iris by a dedicated camera no more than 3 feet from the eye. 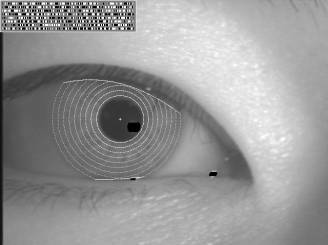 After the camera situates the eye, the algorithm narrows in from the right and left of the iris to locate its outer edge. This horizontal approach accounts for obstruction caused by the eyelids. It simultaneously locates the inner edge of the iris (at the pupil), excluding the lower 90? because of inherent moisture and lighting issues. Iris-scan technology requires reasonably controlled and cooperative user interaction - the enrollee must hold still in a certain spot, even if only momentarily. Many users struggle to interact with the system until they become accustomed to its operations. In applications whose user interaction is frequent (e.g. employee physical access), the technology grows easier to use; however, applications in which user interaction is infrequent (e.g. national ID) may encounter ease-of-use issues. Over time, with improved acquisition devices, this issue should grow less problematic. The accuracy claims associated with iris-scan technology may overstate the real-world efficacy of the technology. Because the claimed equal error rates are derived from assessment and matching of ideal iris images (unlike those acquired in the field), actual results may not live up to the astronomical projections provided by leading suppliers of the technology. Lastly, since iris technology is designed to be an identification technology, fallback procedures may not be as fully developed as in a verification deployment (users accustomed to identification may not carry necessary ID, for example). Though these issues do not reduce the effectiveness of iris recognition technology, they must be kept in mind should a company decide to implement on iris-based solution. Iris-scan technology has traditionally been deployed in high-security employee-facing physical access implementations, although 2002 saw a number of novel, high-profile iris-scan deployments in new applications. Iridian - the technology's primary developer - is dedicated to moving the technology to the desktop, and has had some success in small-scale logical access deployments. The most prominent recent deployments of iris-scan technology have been passenger authentication programs at airports in the U.S., U.K., Amsterdam, and Iceland; the technology is also used in corrections applications in the U.S. to identify inmates. A number of developing countries are considering iris-scan technology for national ID and other large-scale 1:N applications, although to date it is still believed that the largest deployed Iridian database spans under 100,000 enrollees. Notable iris-scan applications include the following. Though it is one of the later emerging technologies in the biometric market, iris-scan is set to grow substantially through 2007. Iris-scan offers low false match rates and hands-free operation, and is the only viable alternative to fingerprint technologies in 1:N applications where a single record must be located. Iris-scan's resistance to false matches is offset somewhat by the the level of training required to use the system effectively. As such, iris-scan will primarily be used in applications that require high levels of security, although convenience-driven deployments (e.g. Privium) will continue. Iris-scan revenues are projected to grow from $16.2m in 2002 to $210.2m in 2007. Iris-scan revenues are expected to comprise approximately 5% of the entire biometric market.